Also feel free to download it. this is the resolution i created it at. Hi everyone! A lot of people requested me to do a tutorial about the techniques that i used to paint the last few images The tutorial is up on gumroad gumroad.com/alexnegrea# and payloadz store.payloadz.com/go/?id=2226… hope you will enjoy it! This model looks like he's got Arnold's musculature. I believe that Stan Winston would be proud. Looks like your redesign had some influence from Ultron Prime. This looked almost like a screen cap, but then i zoomed in and realised how much better it is than the actual movie ! Love the laser-sight in the middle of the minigun Cant miss with that on there ! This thing is absolutely terrifying. Death is all I can read through its eyes. It's an interesting concept, though I still prefer the original, personally speaking. Terminator..I love him so so much! hey Alex do you have a Facebook page ? didnt find you. i like that one, its cool. Awesome! Wait till you get into Zbrush, things get even more awesome from there. what happened to your facebook? WoW thanks for the +watch! ill be back to say thank you! I wish I had a real one of these, programmed to follow my every order without question. I'd send it after that douche bag who killed Cecil the Lion. 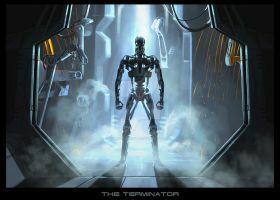 Terminator is one of my favorite Sci fi movies and is one of the best sci fi of all time. Not movie Terminator 3 of course. That was some kind of joke. What happen to your facebook acc? Do we see each other on THU? Thanks dude I closed it for now. Wanted to focus on work more and it seems to work at the moment Yeah i will be at THU. Im going there on the 11th sept. Cant wait to meet you! awesome! I will be in lizbona on the 10th-13th I want to discover the city then move to troi for event ! cant wait it's gonna be guuuuud! Now you'll conquer 3D...what will be left? Good work. to conquer 4d: the ability to draw time itself.